Why is your neck tight? And why is there that nagging pain between your shoulder blades? Here's the biomechanical explanation that's often the issue. Assuming your doctor says you are fine, but you're still hurting, ordinary neck and shoulder pain is not really a mystery. You probably already realize it's because nearly everything most of us do in modern life has us sitting with our arms in front of us and peering forward at something. Your neck is tight because your shoulders are rolled forward and your head is forward most of the time. 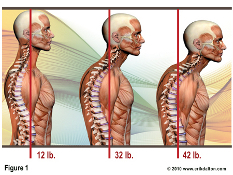 The human head, which averages 12 pounds in weight has an effective weight on the spine of 42 pounds when it''s 3 inches forward of the shoulders. In a sense, the muscles in the back of your neck are in a constant battle to keep your head from rolling off the top of the spinal column. Some of the muscles recruited in this battle are attached to the top of the shoulder blade, so the shoulders are dragged up giving you, as the massage therapist joke goes, shoulder earrings. Meanwhile having the shoulders so high and your arms in front of you to do things causes your shoulders to roll forwards, and your pectorals to always be contracting. 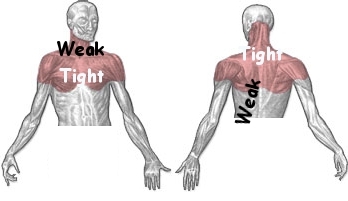 This binds the shoulder blade forward so you cannot raise your arms properly. Much like how women who constantly wear high heels end up with shortened calf muscles, this work is giving you shortened chest muscles. At the same time, the shoulder blades are constantly stretched apart across the back. The poor rhomboids between the spine and shoulder blade just knot up in self defense - like a couple in bed fighting over the covers. Meanwhile in front, that drooping head is in perfect position to be looking at the floor - but you have to see what''s in front of you, so you crank the back of the head down on the neck raising the chin to get your eyes level. It''s a self-reinforcing vicious cycle... and it''s not only causing immediate pain, but it also affects your ability to breathe properly, and puts terrible stress on the disks in your spine. Bodywork can be very powerful, especially in releasing the tight, overactive muscles and shortened fascia that are holding the pattern that has been built in from years of constant forward flexion. A qualified personal trainer can help you learn good and safe ways to strengthen the inhibited muscles, such as the lower scapular (shoulder blade) stabilizers that have nearly given up the ghost in the battle against the overpowering pectoral muscles. But this is a self care article, and even if you are getting weekly bodywork and personal training, that is at most a few hours of intervention trying to compete with over 80 hours of your daily lifestyle. So what are some things that YOU can do about it on your own? I love passive opening exercises. 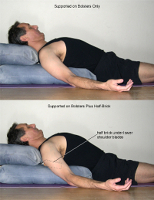 The key with passive opening is to put yourself in the position that will open a compressed area, and relax into it. Stay with it, breathing deeply, breathing into the constriction for approximately 3 minutes. Let gravity do the work. Progressively, you will feel a "letting go". With self myofascial release, when you find the tight spot with your tool (roller, ball, etc.) stop and let yourself melt over the tool. If you just roll over it quickly, you will accomplish nothing more than annoying the knot. * For the area at the base of the skull, to help release the "cranked neck", there are a number of devices ranging from the CranioCradle to Still Point Inducers to the old classic "2 tennis balls in a sock". * Strengthen weak rhomboids, lower trapezius and serratus anterior. 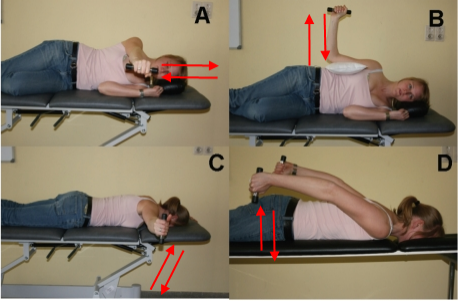 Don''t overdo strengthening exercises of pectorals, upper trapezius and biceps. That just increases the muscle imbalance. In other words, don''t do a lot of strength work where you''re tight. Do strength work where you''re weak. 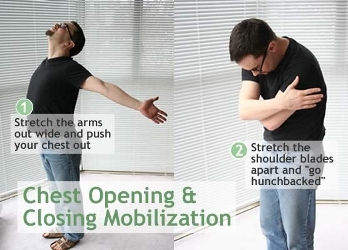 * Take meaningful mobilization breaks if you are doing an activity that is otherwise fairly motionless. Range of motion type exercises, or qigong silk reeling exercises are quite good for this. "For every twenty minutes of stagnation, you should have at least one minute of stimulation: the “20:1” rule." Read more about microbreaking in this article by Paul Ingraham. * Stop craning your neck. If you wear bifocals or trifocals that force you to look through the bottom of the lens to see the screen, and do many hours of computer work at a stretch, you are just asking for trouble. It''s well worth getting glasses that are optimized for the distance between you and your computer screen so that you can keep your head in a neutral position while you work. By the same token, if your job has you spending a lot of time on the telephone, get a headset. Don''t spend hours holding the handset to your ear with your shoulder. Make sure your monitor is not too high. Raise your seat or lower the monitor. * Pay attention to the chairs you sit in, and not just at work - are they encouraging you to slouch, pushing your head forward, or are they encouraging you to let your arms drop to your sides in a neutral position. Bucket seats in cars are terrible, and many upholstered chairs in homes are also designed to be most comfortable slouching. A sitting wedge can improve things as can sitting toward the front edge of the chair. * Put your work where you can keep your arms relaxed with your elbows closer to your sides. This includes locating your keyboard effectively, and these days for most people, even more importantly your mouse, trackball, or other pointing device. * Whenever you raise your arms to do something for an extended period of time or to do something weightbearing, raise them from below so that they are supported by your back muscles (e.g. latissimus dorsi). I like to think the following as I raise my arms: bring the shoulder blades down and back, engage the lats, then let the arms just float up. 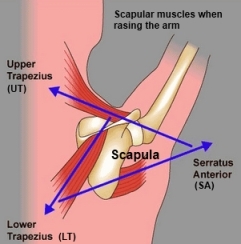 Often people stress their rotator cuff muscles by raising their arms from above. You can tell which way you are doing it by paying attention to whether your shoulders come up towards your ears as you raise your arm - if they do, you are using your shoulder muscles rather than your back muscles to hold your arms up, and it is much more tiring. * Spread your wings and open your chest - or as yoga teachers often cue - widen your collar bones. Disclaimer - this article is for people who are generally considered well by western medicine but who are still in pain. There are plenty of causes attributed to medical conditions as well. I am not a doctor and am not qualified to diagnose or provide medical treatment.